So Long Saalbach; We’ve Mountains of Memories! 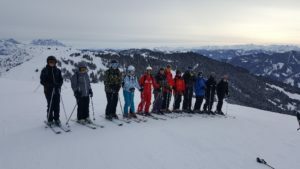 The arrival of February Half-Term heralded Wyvern’s annual ski trip to Saalbach, which as ever, was a great success thanks to Mr Gregory, who worked tirelessly to offer the group the best skiing and evening entertainment possible. Yet again, the base for the week was the Ferienhof Wolflsbauer, with its wonderful hospitality and glorious food. 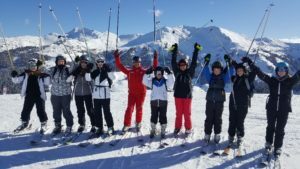 On the slopes, students made remarkable progress and the Slovenian instructors were impressed by the startling improvements made in all four groups. Particular praise to Elizabeth Ames who was the most improved skier; Cormac Oliver, who was the top performer, and Mr Lines, who eventually learned to stop without mowing down more capable skiers! Highlights from the après-ski activities included tobogganing, ice-skating and the Eis Barens ice hockey match, which was breath-taking in its pace and ferocity. Students also excelled on the dancefloor and in the games rooms. The ‘Woodstock’ outfits were totally groovy, as the Wyvern hippies danced one night away at a local nightclub. Students ignored staff mind games and gamesmanship to triumph in the Wyvern Olympics. Only Ms Biddle restored staff morale with a world-class display in ‘Bombs Away’! Thanks to all students and staff for playing their part in a terrific trip – we’re already looking forward to next year!